The Three Little Pugs and the Big Bad Cat is an amusing retelling of the story of the Three Little Pigs. My daughter and I giggled our way through the first reading of this story and there is a particular incident which makes us laugh every time we think about it. It really takes an original look at a story that is familiar to us all. The three little pugs all have very different personalities. Bubbles’ housebuilding is governed by his stomach and Bandit’s by his favourite things. Beauty is the cautious, thoughtful pug whose plan ensures that the three little pugs find a home that will suit all their needs. The plot of the story is the same as the traditional version and the houses are built out of straw, sticks and bricks. The part of the story that made us laugh the most was the way that the Big Bad Cat blew the houses down. We particularly like the way that she blows the house of straw down! There’s a fun twist at the end of the story, my daughter loves looking at the different photos of the three little pugs in their new home. Caroline Attia’s illustrations are full of detail, action and speech bubbles to move the story along. We love the expressions on the characters’ faces especially the Big Bad Cat’s expression when she discovers that the brick house is empty. The three little pugs are photoshopped into the pictures and also have a range of amusing facial expressions which add to the humour in the text, we particularly like the picture of them looking at their top secret plans, my daughter thinks that Beauty’s glasses are funny! 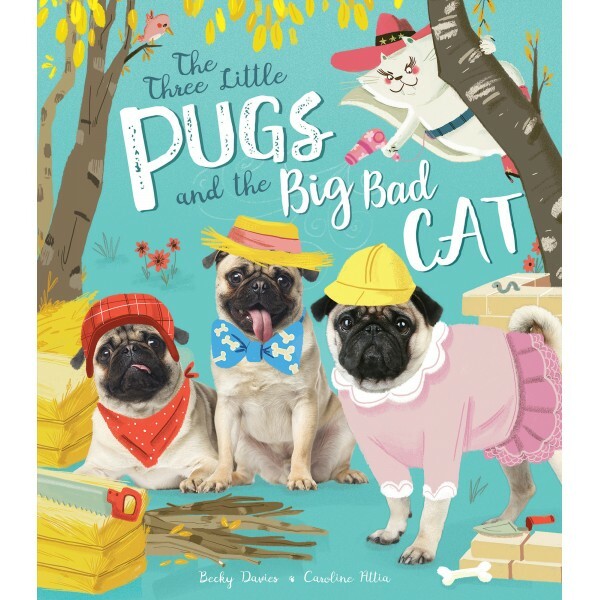 The Three Little Pugs and the Big Bad Cat would be a great story to include in a classroom topic on fairytales. Children could be introduced to the idea of writing fractured fairytales by substituting new characters into traditional stories. They could also rewrite their own versions of the three little pigs with their favourite animals. If you are looking to introduce your children to fractured fairytales this is a really amusing story to choose. We would love to know which are your favourite fractured fairytales. Please leave the titles in the comments. Thank you to Little Tiger Press for sending us The Three Little Pugs and the Big Bad Cat. There were some parts of the story that I just couldn’t read out loud as I was laughing so much! Which stories will you be telling on National Tell a Fairytale Day? Hi Catherine, I don’t know where you find your selection of children’s books but I love them! When I was expecting my first child I didn’t get excited about clothes and toys but started collecting books to enjoy with my children. If only the internet was a thing back then! This book sounds just as fun as your other choices. A twist on a classic tale makes it relatable and shows children it is okay to use a bit of imagination and change things a little. I’m very lucky that several lovely publishers send books for us to review. There are so many great children’s books being published right now that it’s impossible (unfortunately) to include all the great books that we are sent! I love it when an old fairytale is revamped. And the three little pigs is one of my favourites, my niece has a pug and I bet she would love this. It’s a very clever twist on the original and some of the expressions on the pug’s faces are hilarious! !